The following text has been adapted for the web with slight modifications from ‘Darwin’s early notes on coral reefs,’ by Frederick Burkhardt, which was previously published as an appendix to volume 1 of the Correspondence of Charles Darwin. No other work of mine was begun in so deductive a spirit as this; for the whole theory was thought out on the west coast of S. America before I had seen a true coral reef. I had therefore only to verify and extend my views by a careful examination of living reefs. But it should be observed that I had during the two previous years been incessantly attending to the effects on the shores of S. America of the intermittent elevation of the land, together with denudation and the deposition of sediment. This necessarily led me to reflect much on the effects of subsidence, and it was easy to replace in imagination the continued deposition of sediment by the upward growth of coral. To do this was to form my theory of the formation of barrier-reefs and atolls. The emphasis in these notes on global crustal changes strongly suggests that Darwin’s theory of coral reef formation originated as a consequence and corollary of his chief preoccupation at the time: the elevation of the South American continent. Darwin had by that time become a ‘zealous disciple’ of Lyell and, having found ample direct evidence that elevation of the continent had occurred, he invoked Lyell’s principle of compensatory change in the earth’s crust and hypothesised a corresponding subsidence in the Pacific. The coral islands would thus furnish proof both of that subsidence and, indirectly, of the elevation of South America. Paradoxically, Darwin’s adoption of the principle of compensatory crustal changes led him to depart from Lyell’s own view of the geology of the Pacific. In his chapter on coral reefs in the second volume of the Principles of Geology, Lyell had adopted the prevailing view of the time that ‘lagoon islands’ (the annular reefs that we now call atolls) were ‘nothing more than the crests of submarine volcanoes, having the rims and bottoms of their craters overgrown by corals’ (2: 290). This view was based an observation by two French naturalists, J.R. Quoy and J.P. Gaimard, who had shown in their Zoologie of Freycinet’s Voyage (1824), that reef-building corals lived only in shallow water. The idea that atolls were volcano craters that had merely been encrusted with a thin veneer of corals not only accounted for the ringlike shapes of the reefs, it also explained how such reefs could have been formed in parts of the Pacific where the water was otherwise far too deep for reef-building corals to grow. Darwin was certainly familiar with Lyell’s chapter and with the observations of earlier Pacific voyagers, notably the British hydrographer Frederick William Beechey, who had just published the results of his survey of 32 coral islands, and the Frenchmen Quoy and Gaimard. As Darwin wrote to his sister Catherine, Darwin had begun reading about ‘the South Sea’ in May 1835. The Beagle library was well stocked with works about earlier voyages and the Admiralty orders had specifically recommended surveys and geological descriptions of the channels and lagoons of the islands (Narrative 2: 38-9), so it may be presumed that he was well informed on what was known about them. But of his reading, only one note occurs, in Notebook no. 1.17, written shortly after a visit to Lima in August 1835: ‘Corall rapidly growing in Low islands’. Shortly after returning to England, Darwin told Lyell of his theory. Lyell was immediately convinced by it. ‘I must give up my volcanic crater theory for ever . 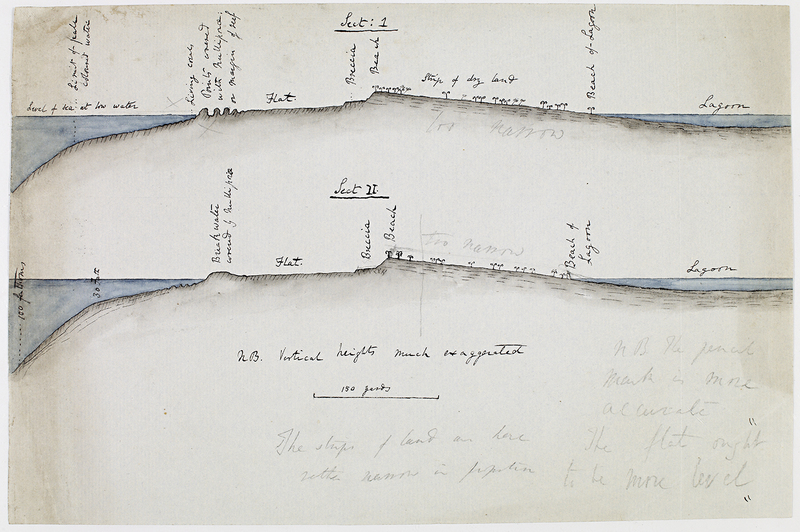 . . ,’ he wrote to John Herschel on 24 May 1837, ‘the whole theory is knocked on the head & the annular shape & central lagoon have nothing to do with volcanoes nor even with a crateriform bottom . . . Let any mountain be submerged gradually & coral grow in the sea in which it is sinking & there will be a ring of coral & finally only a lagoon in the centre.’ (Wilson 1972, p. 449). At Lyell’s urging, Darwin read a paper on his coral theory before the Geological Society in May 1837. His most fully developed statement of the theory, The Structure and Distribution of Coral Reefs (1842) was based on intensive reading and correspondence with observers of coral reefs in other parts of the world. Though adopted by many geologists, it was a subject of controversy until the 1950s, when test borings in the Marshall Islands confirmed that the foundations of Pacific atolls had indeed sunk many thousands of feet. Darwin tells his sister Susan that has told Captain FitzRoy and Captain Beaufort that before he agrees to go on the Beagle, he wants to be sure they will visit the South Sea Islands: [9 September 1831]. The first evidence of ideas that led to Darwin’s theory of coral reef formation: A geological friend of Darwin’s in Chile, Robert Alison, alludes to Darwin’s newly-formed idea that the elevation of South America was matched by the sinking of Pacific islands: 25 June 1835. Darwin confides to his sister that he believes Lyell’s explanation of atoll formation to be a ‘monstrous hypothesis’: 29 April 1836. Darwin exclaims that it ‘rejoices the inward cores of [his] heart’ to have finished writing his book on coral reefs: letter to Leonard Jenyns [9 May 1842]. Armstrong, Patrick. 2004. Darwin’s other islands. London and New York: Continuum. Stoddart, David R. 1994. This coral episode: Darwin, Dana and the coral reefs in the Pacific. In Roy MacLeod and Philip F. Rehbock, eds, Darwin’s laboratory: evolutionary theory and natural history in the Pacific. Honolulu: University of Hawaii Press. Is sending fish skins and bottles off to Cambridge Philosophical Society. Fish numbers [ofZoology], now finished, give CD satisfaction when he doubts whether he ought to have applied for Government money. Wishes Thomas Bell would finish his part [Reptiles]. CD has just corrected last page of index ofCoral reefs.